summarizing 2014 in the twenty, most popular posts of my blog duly reported by my traffic generator. 2. The Button Necklace Pattern which proved to be quite of a success. 4. 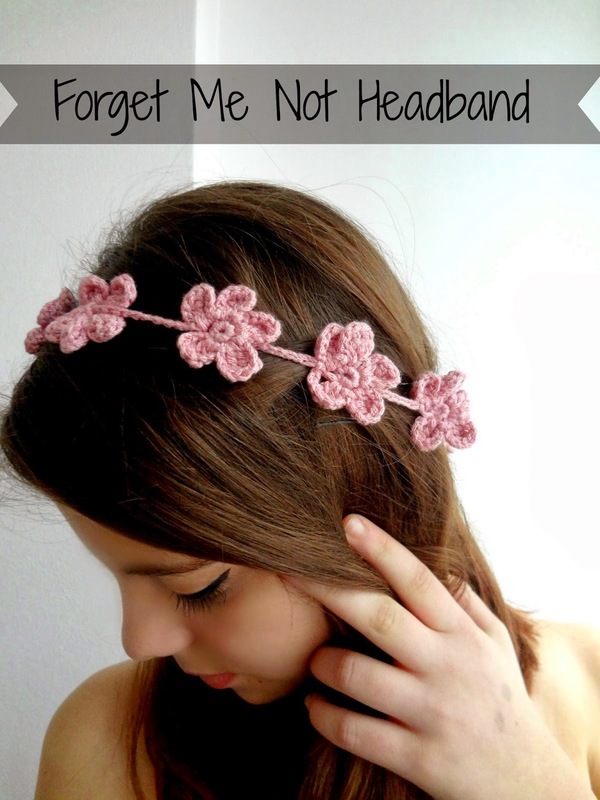 The Forget Me Not Headband which is an absolute winner with 9941 views as I am writing this post. Generally, the free tutorials are generating the most traffic due to constantly being shared, so to everyone's pleasure I plan to continue posting free tutorials in the next year too. 5. The Mini Doilies that appeared in Simply Crochet One of the highlights of the past year, something that opened up doors to new venues. 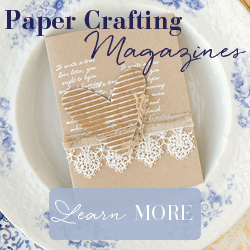 A huge thank you to "Simply Crochet" Magazine! 7. 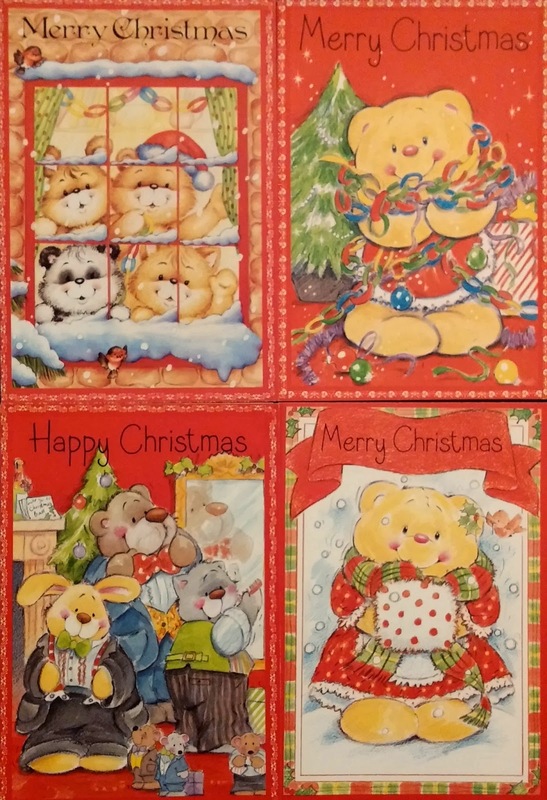 The Lost Road Nostalgia - thinking of my granny while searching for the pattern. 8. 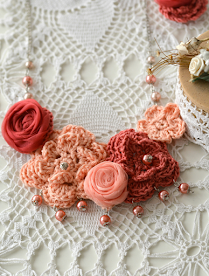 The Spring Flower Necklace - the play with flowers continues with this pattern in a cheerful design. 9. The Vintage Bracelet - my, this one is still my favourite! 10. Happy Woodland Mobile - lots of mushrooms, flowers and snails for unlimited happiness. 11. The Cherry Blossom Necklace - to mark the coming of spring. 12. DIY Backyard Ideas - I love sharing ideas I catch on the internet, and obviously my readers loved the post too. 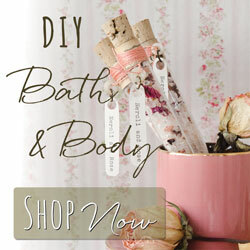 Something I might incorporate more on the blog. 13. 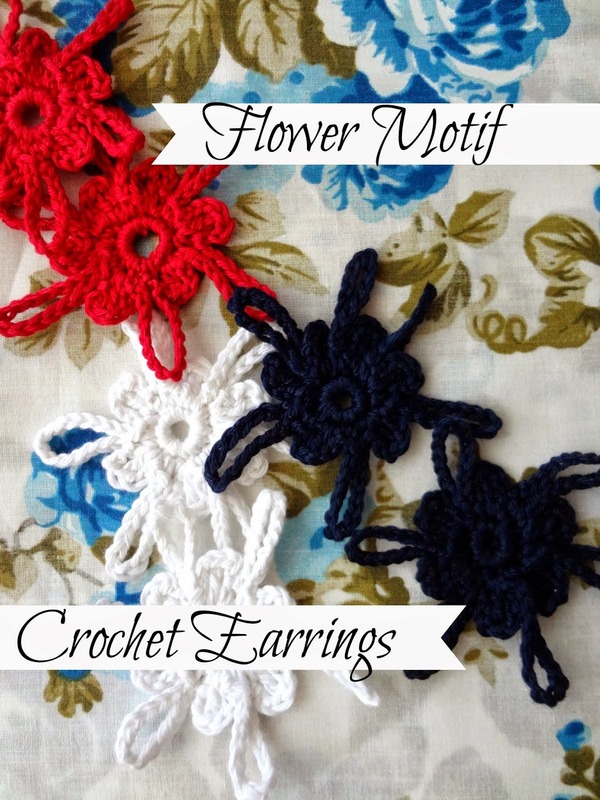 The Flower Motif Earrings - what an easy pattern for last minute gifts! And they even make a fab necklace. 16. The Boho Bracelet - wear the flowers on your hand! 19. 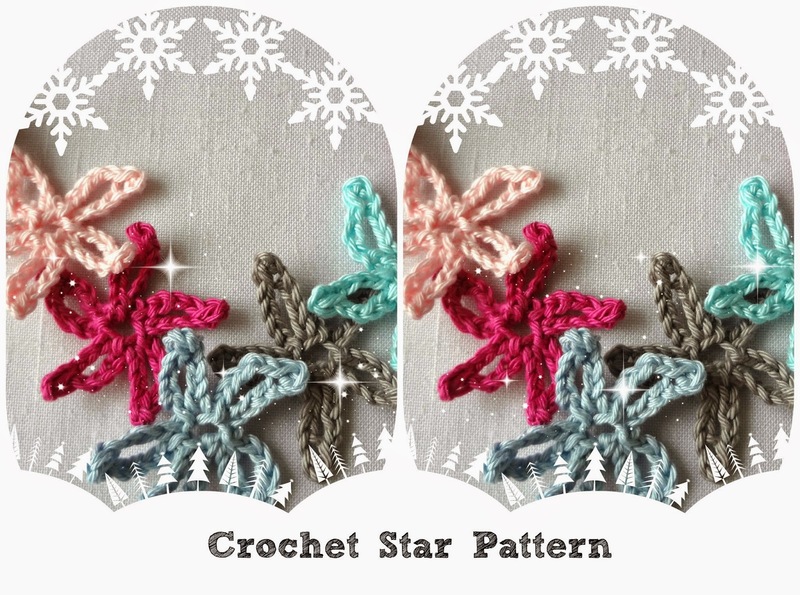 How to read Crochet Charts - I am overwhelmed at the traffic this received and how it was shared, so I have a post in the make about reading a granny square which will come early in January, and I would love to extend the series as much as I can. Or until it sparks interest. 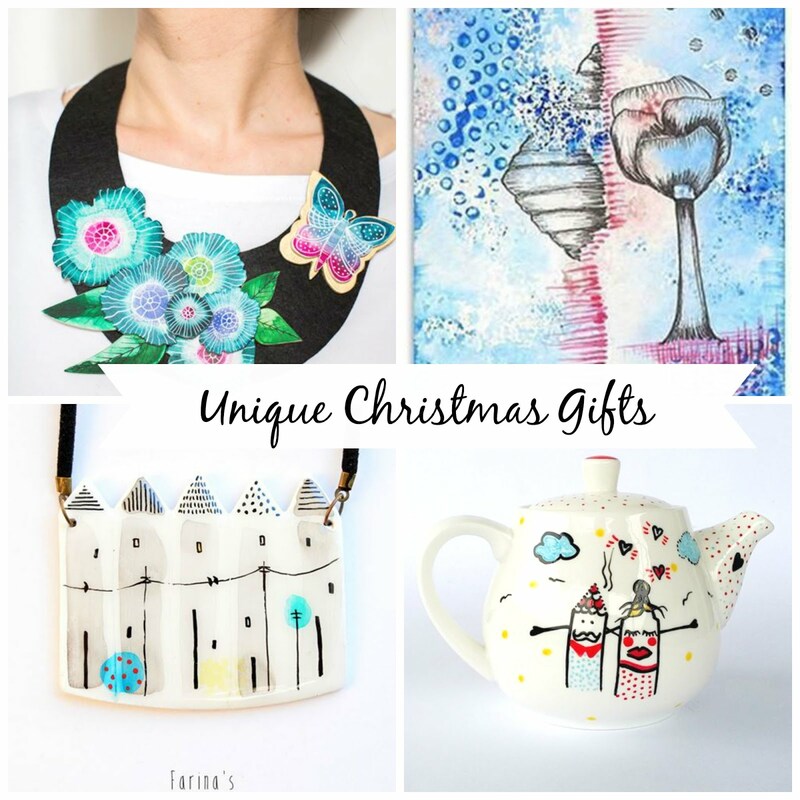 I do hope you all had lovely time for Christmas! In a couple of days we are going to finish the year, so I set myself to work on projects that I've started and lost interest in and on which I have worked off and on for a longer period. 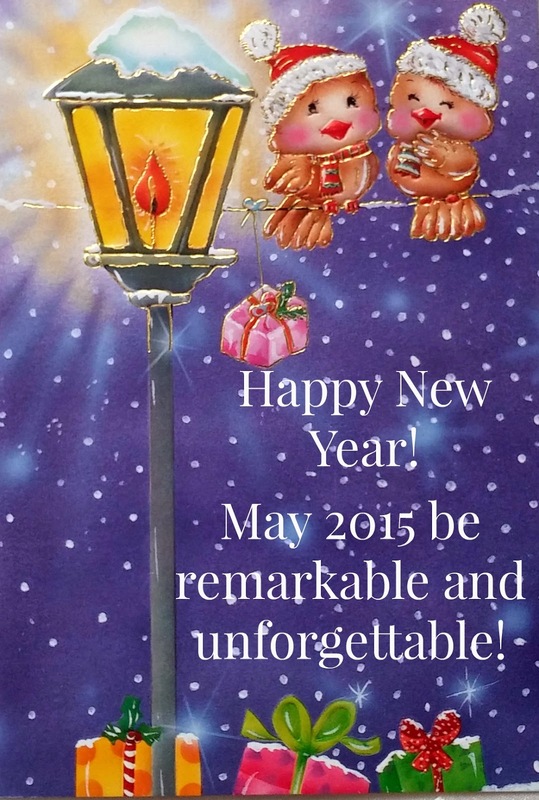 I certainly don't want to start the new year with them. 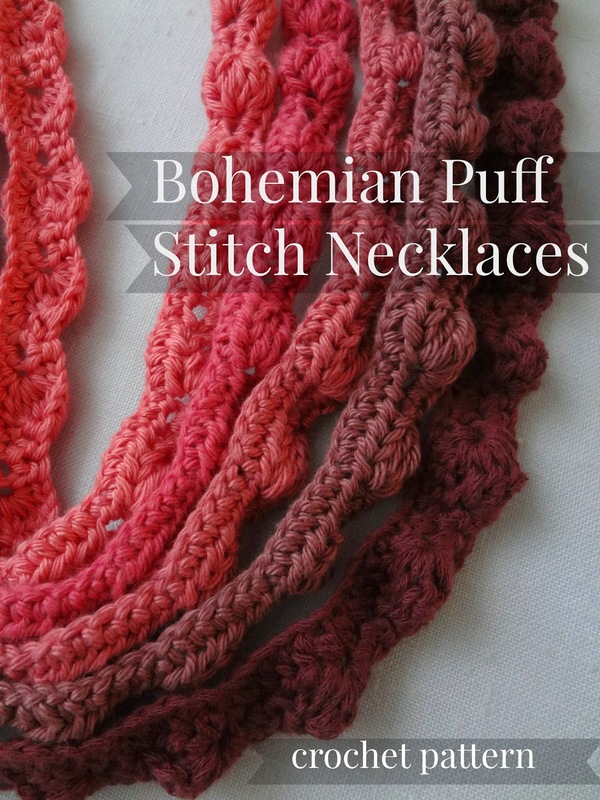 One of those projects were these necklaces, actually a new pattern I made using the puff stitch pattern. 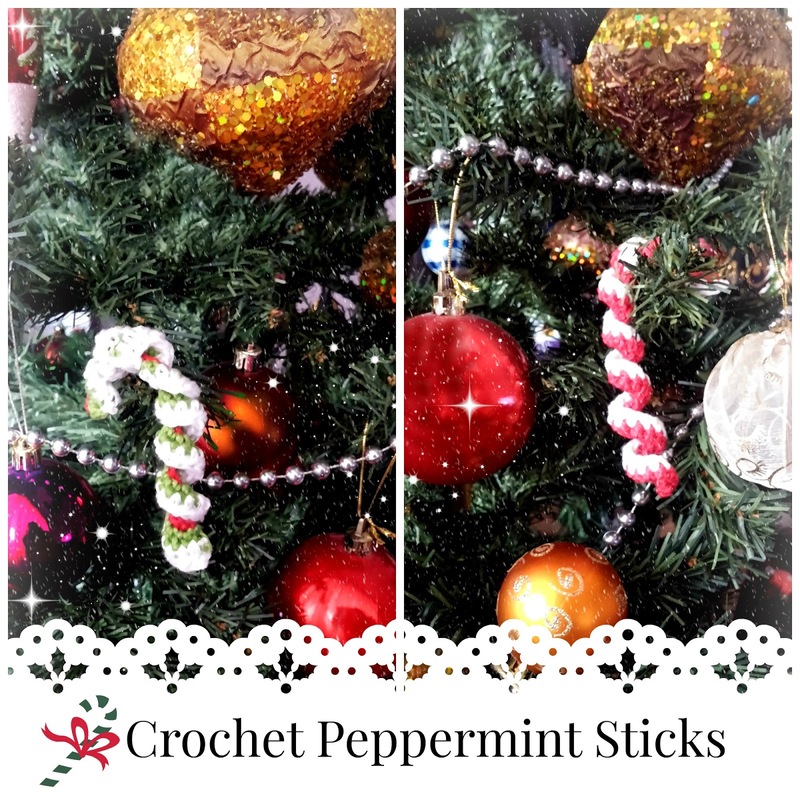 This year Jacob's teacher asked the kids to make some Christmas ornaments and cards to decorate their tree and classroom, so while Jacob was working on his card I found this heavenly easy pattern for these peppermint swirly sticks to be used as ornaments. I used sport yarn and 1.9mm hook. 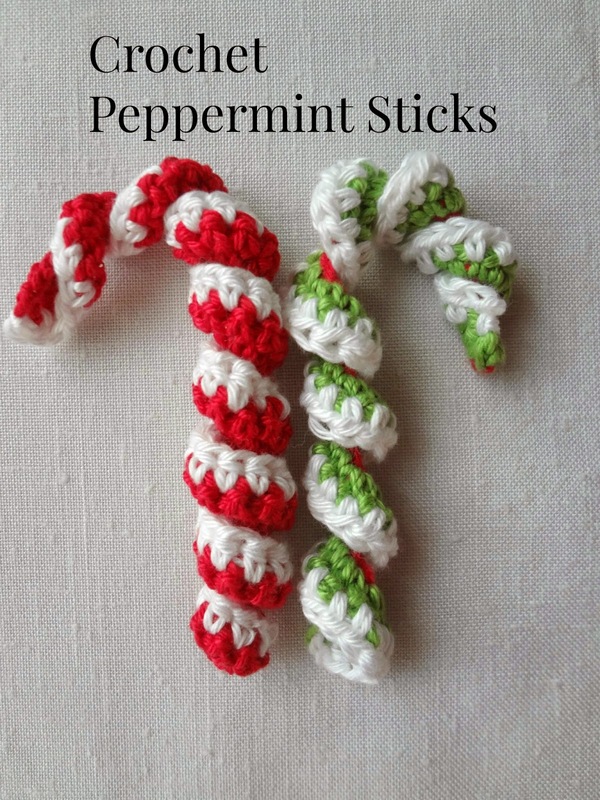 It is sturdier and bigger than the three-colored stick, so I made a variation of the pattern. When done, roll tightly and spray with starch or insert a wire inside it to shape the stick. 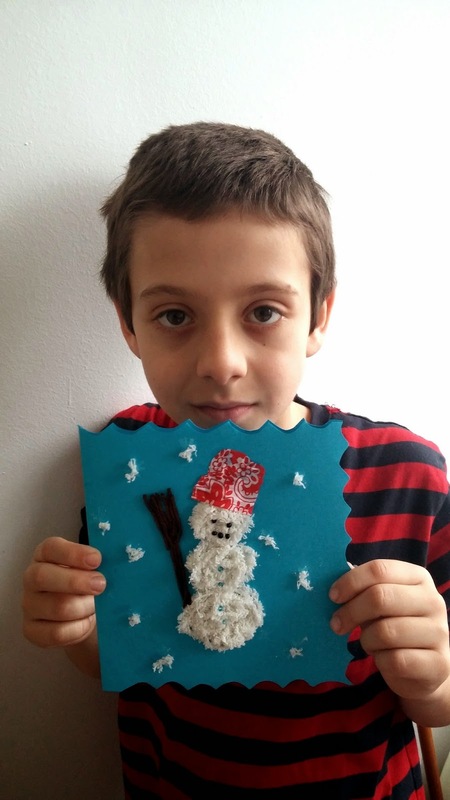 And last but not least, here's my Jacob with his Christmas card. Entirely his idea how it should look. The journey around the world is getting better and better. I am sorry I haven't been able to follow it as closely as I would love to. 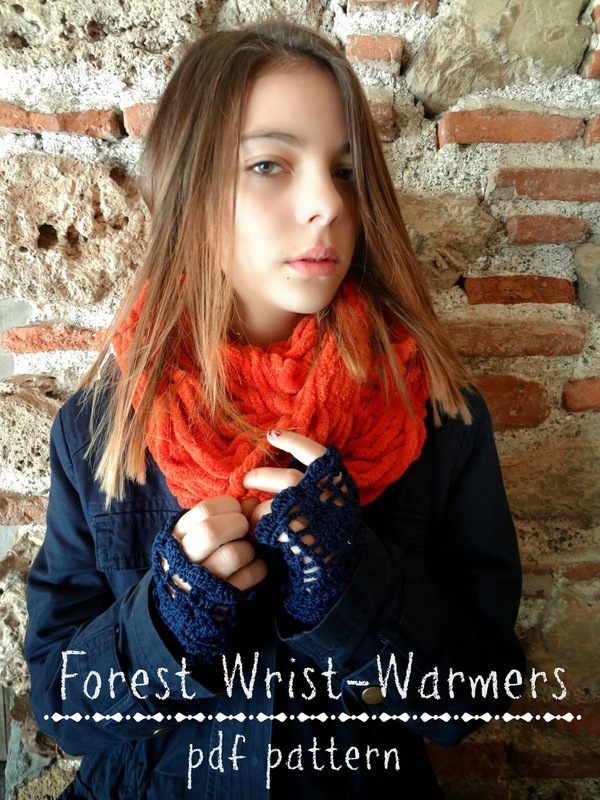 Natalie Pelykh, a knitwear designer living in Ukraine who makes these amazing kids' accessories and presents them with stunning photography. 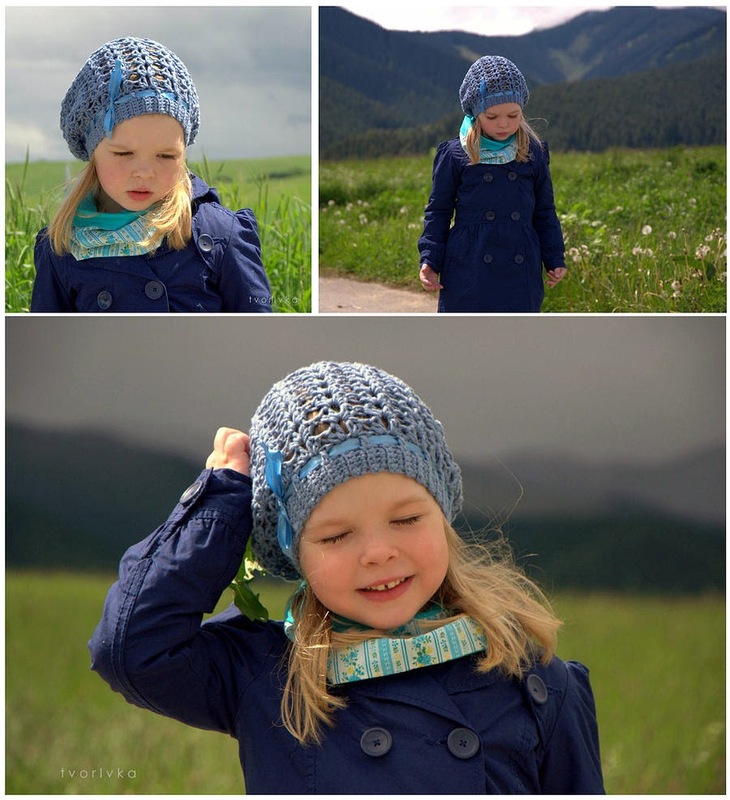 Ivana Jackova from Slovakia with her favourite design of this slouchy hat. Jasna Kaludjerovic from Serbia and her interesting hat and dress designs. 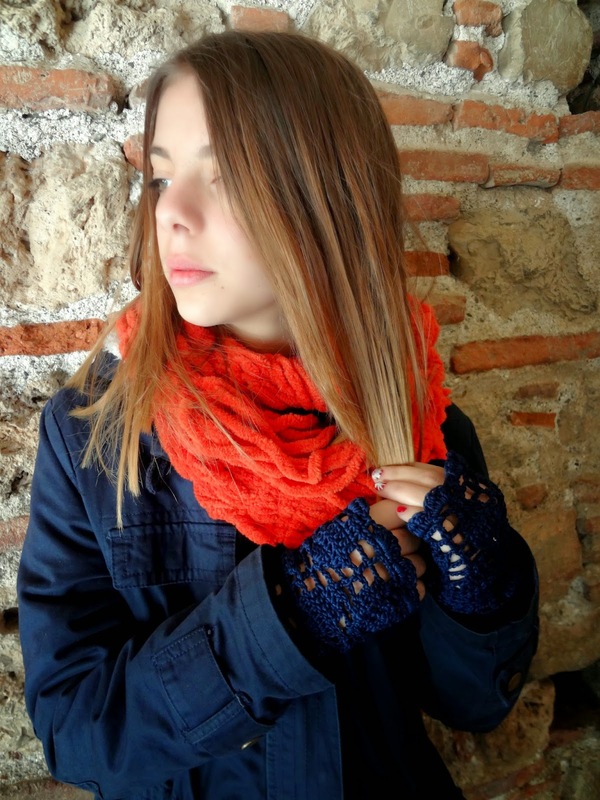 Nicoleta Ganea from Romania who makes knit garments. 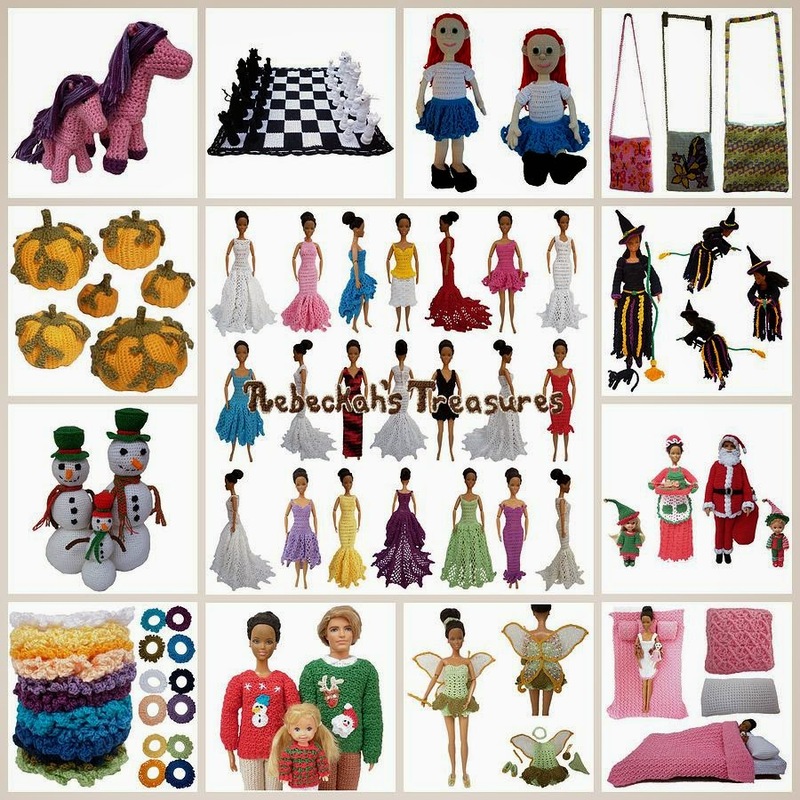 Rebeckah Ferger from Panama who makes amazing toys, doll dresses and accessories. 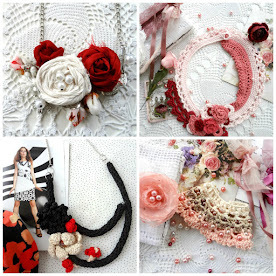 A couple of days ago I was awarded the Best Crochet Jewelry by Kathryn Vercillo and you can read the whole post on her blog here. I follow her 2014 Awesome Crochet Blog Awards, but I didn't even dream I would be one of the awardees. 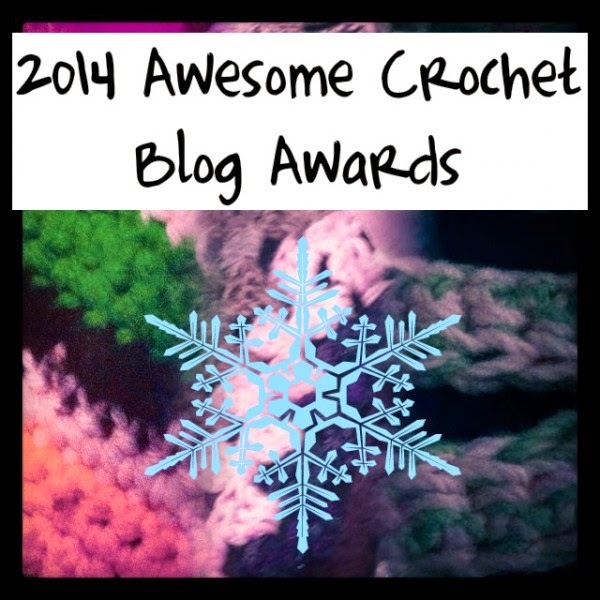 What Kathryn says about the awards: The 2014 Awesome Crochet Blog Awards are a set of awards that I created to honor and celebrate the best crocheters in the online community. Each year I create 30-ish categories and name the best folks in those categories. 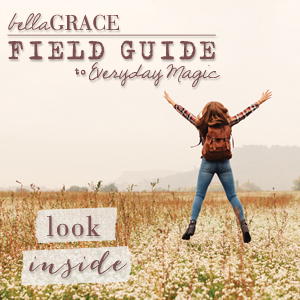 It’s informal and the awardees don’t receive anything tangible but it’s one way to recognize the awesomeness that’s happening out there all year long. Of course, I try to do this weekly with my Link Love posts but the annual awards are on a slightly bigger scale where one person per day can get recognized for their own unique contributions. Maya often works with yarn. 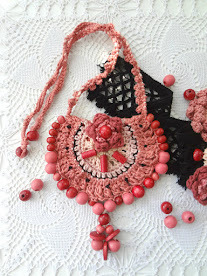 Many of the people who do great crochet jewelry work with thread or wire or focus on beadwork. 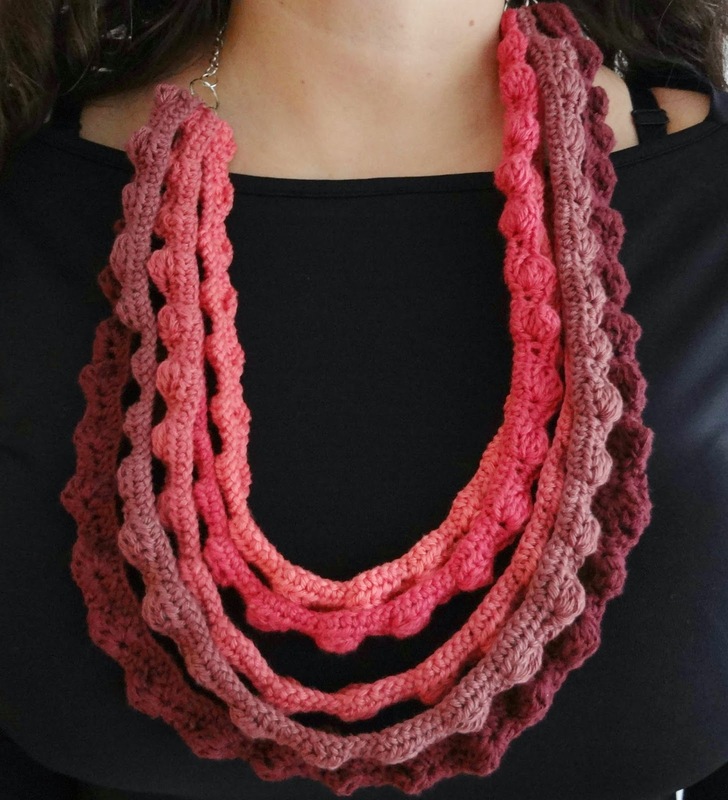 All of those things are great but yarn is what most crocheters work with so I love that she represents this aspect of crochet jewelry so well. Although she does work with mixed media at times, the yarn crochet is really the centerpiece. 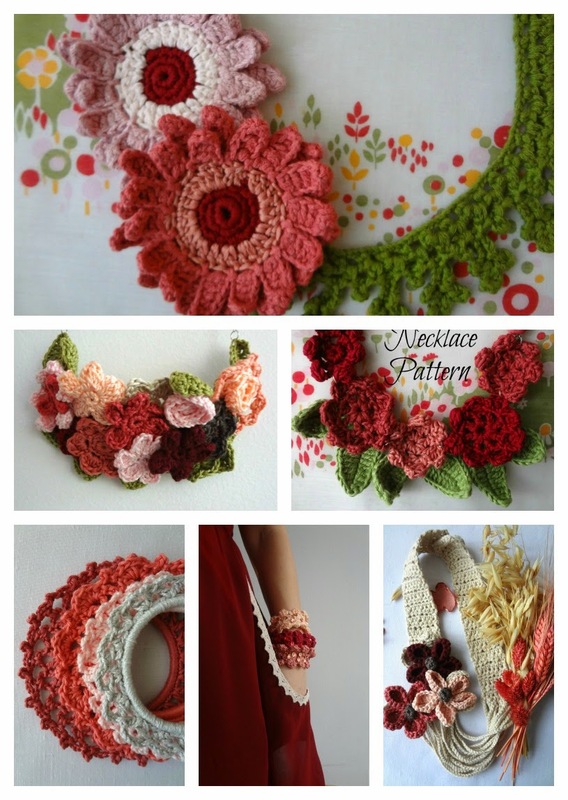 I am inspired by the organic feeling that runs through many of her crochet pieces. She doesn’t make exact replications of flowers in nature but the colors and textures are very organic. Beautiful. 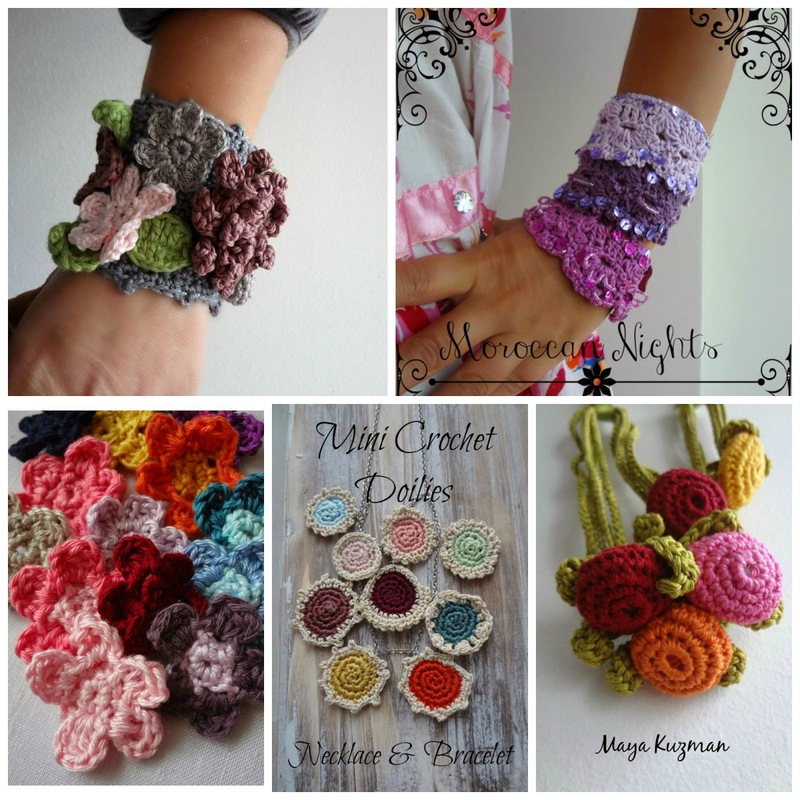 The crochet jewelry that she makes to sell is truly exquisite. There is a jewelry gallery here in San Francisco and her work would stand up against any of the artists that I’ve seen featured there. What I can say to Kathryn is a huge THANK YOU for your ardency in promoting crochet designers and unselfishly and perpetually investing your time in acclaiming our work and endeavors. Kathryn is a San Francisco based freelance writer, blogger and crocheter who learned to crochet from her mom when she was a child. 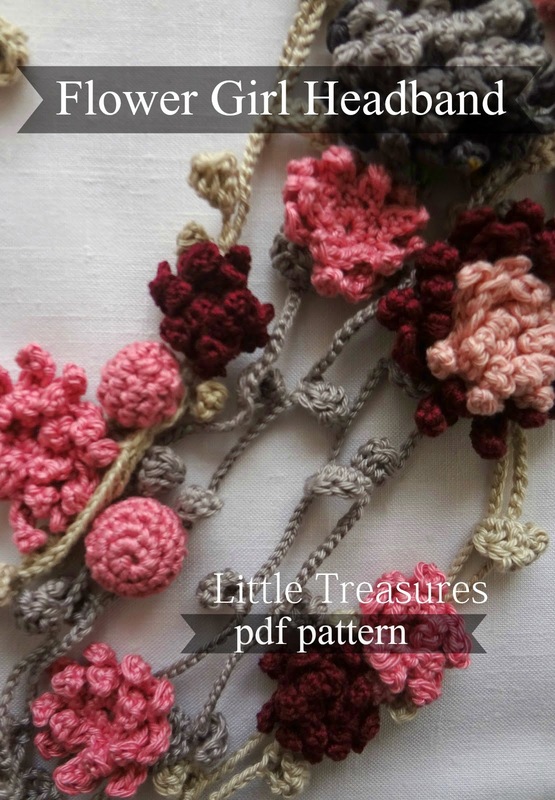 She re-discovered crochet in her twenties, when she was going through a really difficult bout of depression. 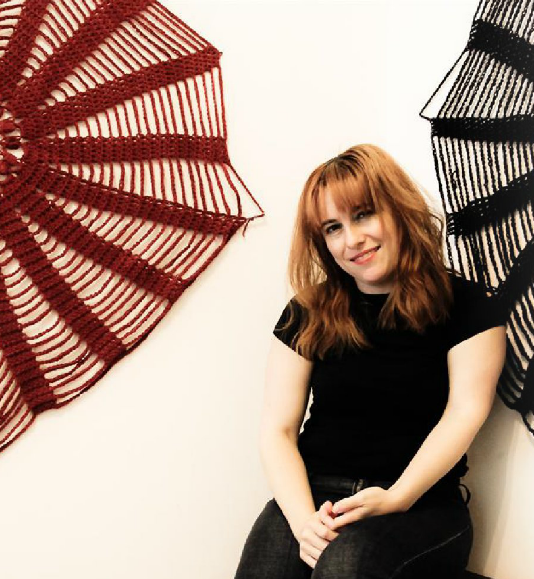 According to her words, crochet helped her heal and connected her to a great community and became a key part of her life. 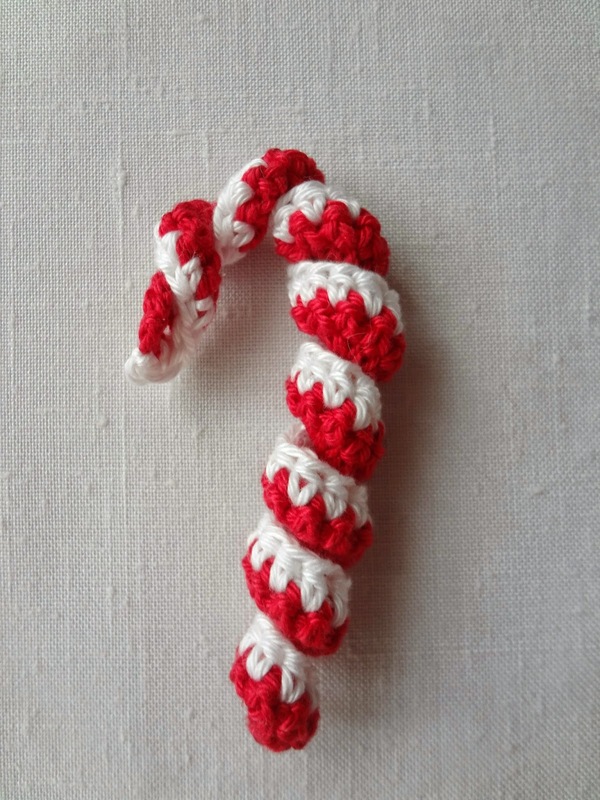 She says: "I started this blog to celebrate crochet and to do my part to help connect and honor all of the designers, crafters, writers and makers who are linked to crochet in some way." 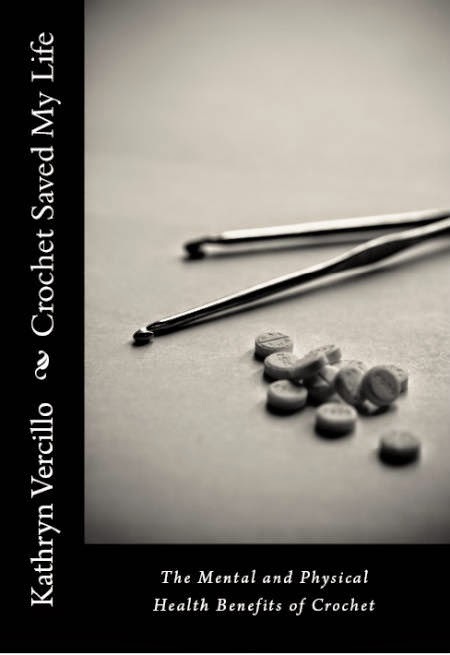 She is the author of the book "Crochet Saved My Life". Find more about it here. 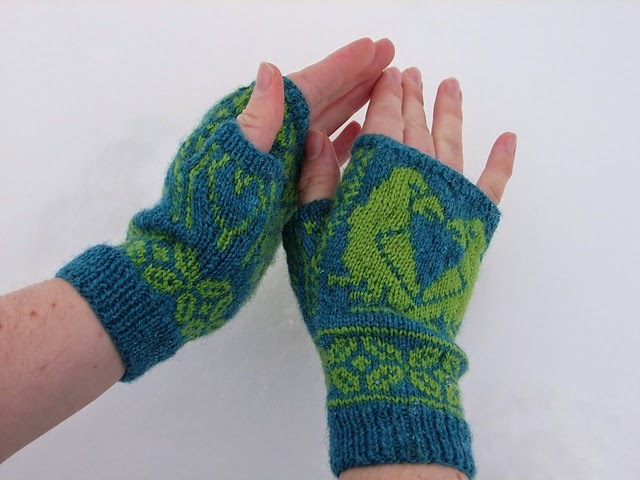 When I saw my grandma's sampler showing these little trees (at least they look like trees to me :) I fell in love with it and knew I would try my hand in working the pattern out to fit for some warmers. 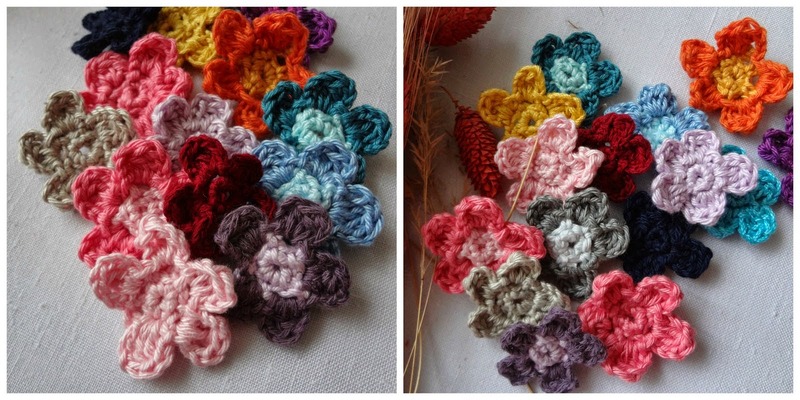 I made two versions and the second I believe is more beautiful because I added picots on the border. The tutorial I made contains that second version. The pictures here show the first version. The pattern for the warmers. I have a box full of my grandma's samplers. She was an extraordinary woman who never wrote any pattern down and always said she had them all in her head. And truth be told, she did. She was so adept in crochet and knitting she could work out a fantastically difficult pattern just by looking at it. And for some of them she made samplers which I am the happy and proud recipient of. I hope I manage to work out some of her other samplers - it would mean a lot to me - communicating with her again through her work. Today, creating a mood board for a future project I looked for inspiration in my Mori girl board and chose these because I love when winter doesn't have to be gray, gloomy and dim. 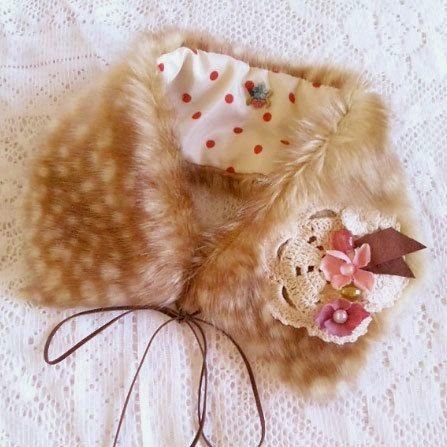 The fur collar above is an easy and fantastic project I am considering making. 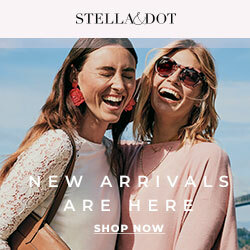 Now, I am a not a real nor fake fur loving person - quite indifferent to it to be honest, but seeing this have stirred my creative juices and what I love most about it is the crocheted doily with the lovely flowers attached to it. 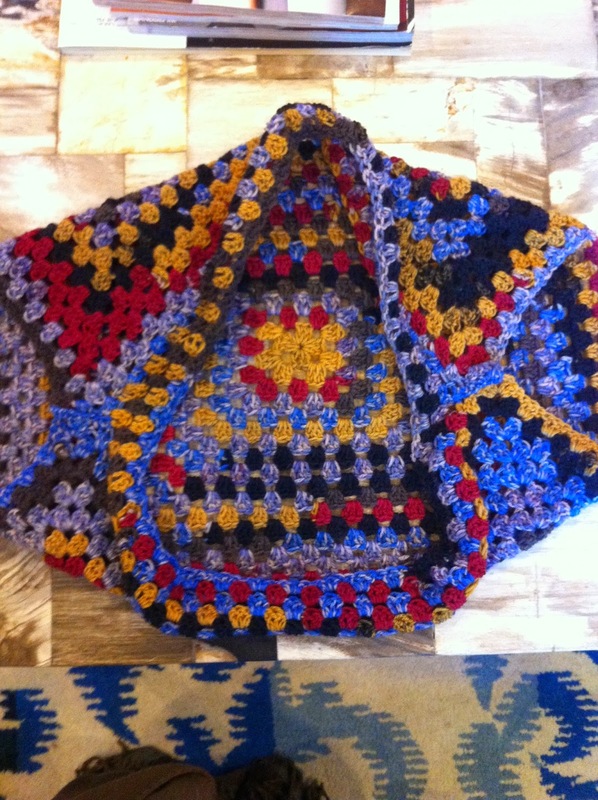 Then there is this amazing shawl adorned with pom-poms. I don't wear shawls over my coat, but if I make the right combination, this option is not excluded too. And last - layered clothes. Something I find quite practical and necessary lately. Find them excessively attractive when there are contrasting textures. Hope you get inspired too! I hope you had a lovely, relaxed weekend. We've been pretty busy in our household, making some new decorations. Luckily the tree has been set up for weeks now so all the mayhem around it subsided, and now we are concentrating on little finishing details. I made these to use as appliques and for gift wrapping - the pattern is so easy I couldn't resist not posting it here. 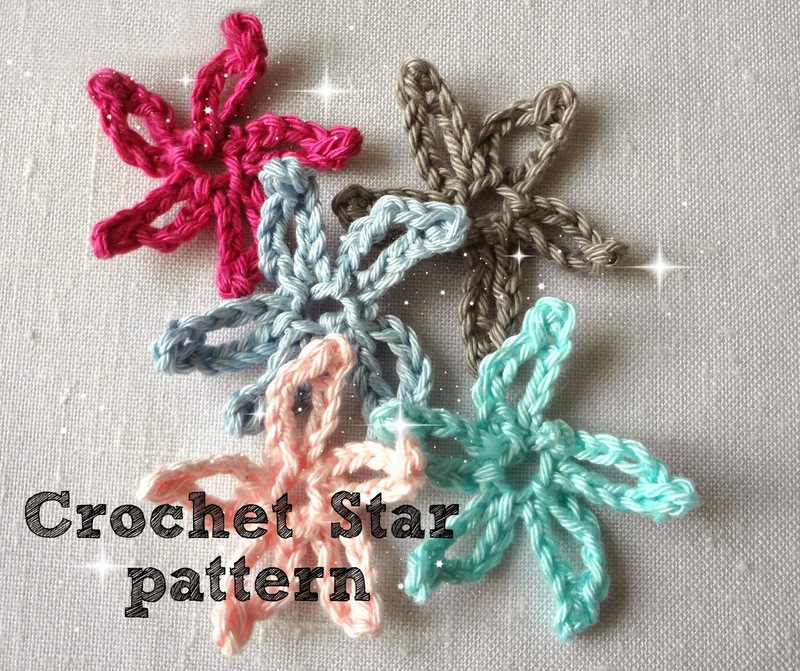 So, for these stars I used sport yarn and 1,9 mm hook. They are worked in just one easy round. First, chain 7. 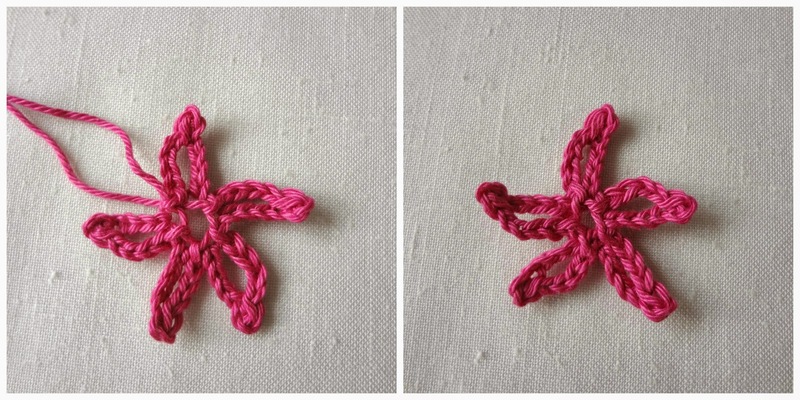 You need 4 stitches for the body (arm) and 3 for the picot. For the picot sl st in the third st from hook. Here you can see the picot made. Next, chain 4 stitches for the other side (arm) and slip stitch it with the beginning chain of the first arm. Like this. The first one is made. Now we are going to make 4 more. Repeat the pattern: chain 7, sl stitch in the 3rd st from hk to make a picot, chain 4 more, sl st it in the first chain of the arm. When you make all 5 of them, join the last arm with the first by making a sl st.
Cut yarn, tie a knot to secure it and weave the ends. 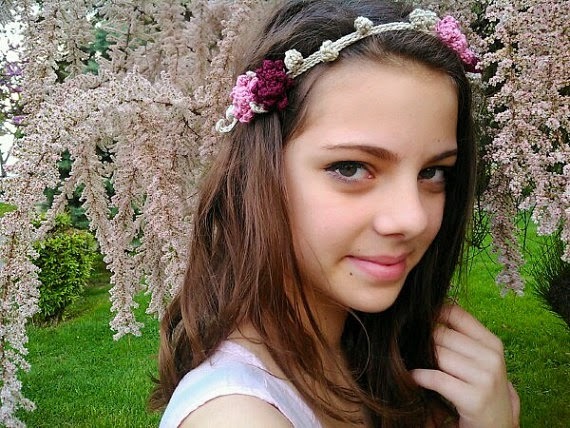 Lately I had a huge order on these enchanting headbands and inquiries about the pattern, so I said "why not?". Hi guys! I hope you are well and that everything is fine. I was away for a bit on a short trip abroad, filling my batteries(really needed that one) and airing my head - as I like to put it. 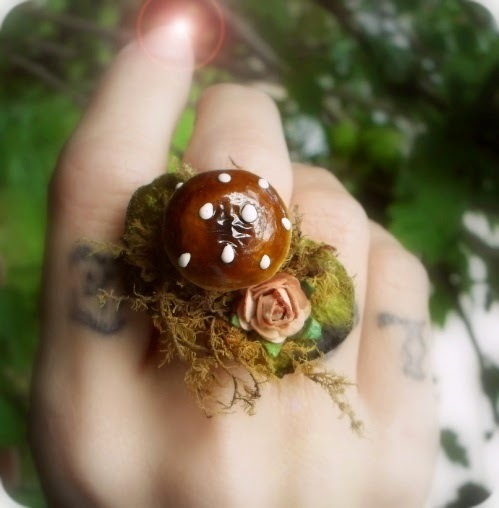 But now I am back I would love to introduce another fantastic designer I have the pleasure to meet through the GAL and that is Jessie McKitrick also known as Tweedlebug on Ravelry. 1. Can you introduce yourself for my readers, please? Hi, I’m Jessie McKitrick, from Edmonton, Alberta, Canada, and my blog is at grammargrouse.blogspot.ca. While I have been self-publishing my designs for awhile now, I just had my first sweater pattern published in print, available in the September Issue (#39) of Knit Now Magazine. 2. 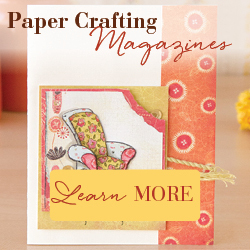 How many years have you been knitting and / or crocheting and what do you specialize in making? I’ve been crocheting since 2007, knitting since 2008, and spinning since May. I tend to work a fair bit with stranded colourwork, but I do enjoy working with cables as well. 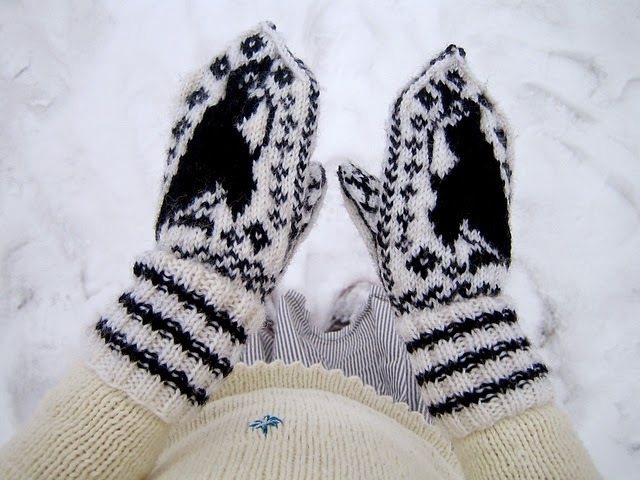 Mittens are definitely one of my favourites! 3. Can you describe your designing process? How do you start a project? Do you choose the yarn first or envision and draw it first? I usually spend a fair bit of time envisioning the project, drawing, making notes, and then choosing yarn and swatching. However, sometimes the yarn does come first, and then I will tailor the project to the yarn instead of the yarn to the project. 4. What inspires you the most in creating your products? In all honesty, I can’t resist a good mood board! When publishers put out a mood board, I am drawn towards it and often come up with at least two or three ideas to submit. For my self-published work, I just make a note of ideas when they strike (the sources can vary as widely as a set of colours from a garden, a sweater in a T.V. show, a texture glimpsed), and then re-visit my notes when I’m looking to develop an idea. Finding inspiration is not the tricky part; finding the time to develop the ideas is more the issue. 5. 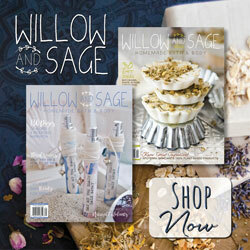 What is your favorite knitting / crocheting place? My favourite place to stitch is my living room couch. I’ve made a bit of a nook for myself by adding a bookshelf next to the couch. I keep ongoing projects on a tray on the side table, and keep knitting books, needles, crochet hooks, roving, spindles and, of course, lots of yarn, on the bookshelf. 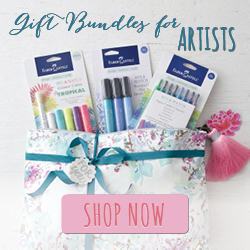 6. Who are your favorite designers (if you have any in fiber arts or otherwise) and why? I’d say Veronik Avery, Carol Feller, Kate Davies, Ysolda Teague, and Ann Weaver. 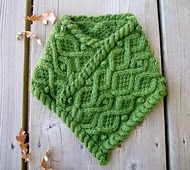 They all make beautiful, clever things that always make me want to cast on right away (if only I had the yarn handy). 7. 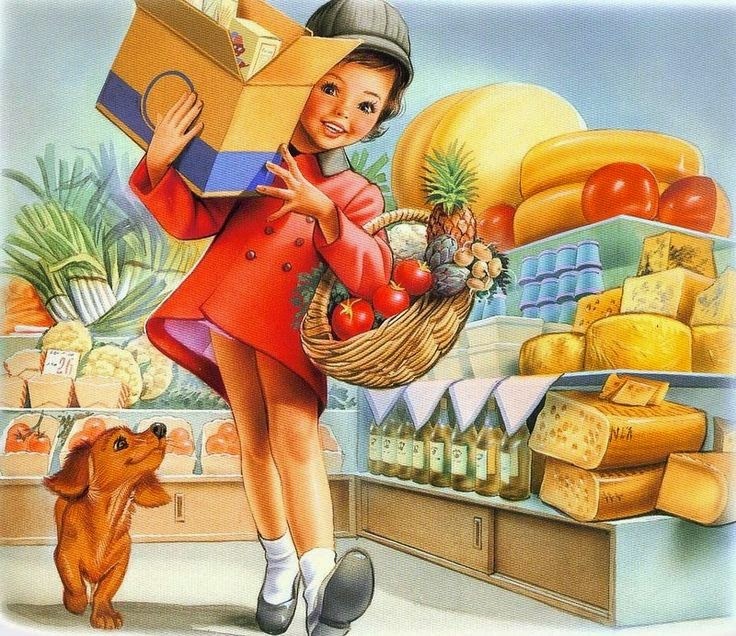 Do you have a favorite design in your portfolio and what inspired you to make it? At the moment, my Irish Cowboy neckwarmer. 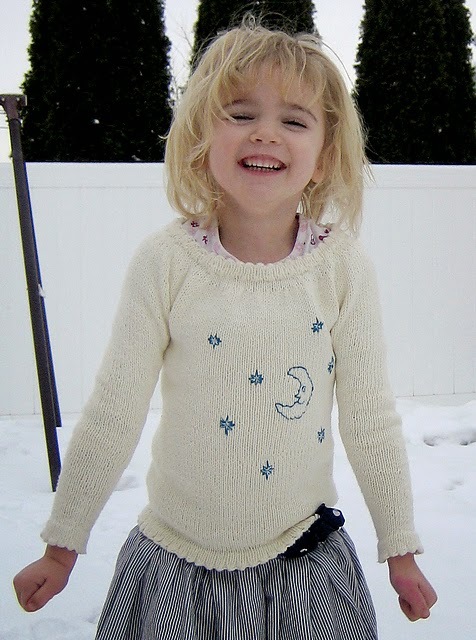 I really enjoyed knitting this one up, even the second time (normally, I only seem to want to knit something once). I had some leftover cashmere blend yarn, and wanted to do something with it because, you know, who wastes cashmere? This would definitely be a case of the yarn dictating the design, because it seemed to me that the optimal place to wear cashmere would be around the neck. Even better, it should end up with a semi-triangular shape so as to fill in the v-neck on my winter coat. I decided to make a rectangle, then sew it into place to create that triangle. I wanted lots of lovely cabled texture, so worked out a pattern that I liked, and worked in the moss stitch background and a few bobbles to round things out. Normally, I’m not actually a huge bobble fan, but sometimes you just need a few. I wear mine every time I head outside this time of year, and it is cozy and warm! 8. Any other crafts you like to dab into? I do a bit of sewing, and quite enjoy it. However, I usually have to talk myself into getting around to starting, which is not a problem I have with knitting or crochet! Once I do start, I usually spend the next day or two straight working on the sewing. I recently took up spinning with a drop spindle. I have a couple of projects on the go, and several more being planned. I find spinning to be a nice counterpoint to knitting design. If I need a quick moment away from my work, I can pick up a spindle, spin for a little bit, put it back down, then get back to work again. My perfect day would involve waking up early yet feeling as though I’ve had tons of sleep, enjoying a cup of coffee while knitting and visiting with my husband, followed by a lovely family breakfast and either an outdoor or craft activity with the kids (or both!). More coffee, knitting, spinning, then a trip to the library with the family, followed by watching a movie all together while enjoying pizza. Cozy book-reading time to follow. 10.Anything you’d like to add and I missed to ask? Can’t think of anything at the moment, but I do want to say that I really appreciate you taking the time to interview me. Thank you Jessie for being here! Let's Play Favourites at Lena's!